Including the NEW Electronic Recordkeeping Requirments. Under the OSHA Recordkeeping regulation, covered employers are required to prepare and maintain records of serious workplace injuries and illnesses, using the OSHA 300 Log. This information is important for employers, workers, and OSHA in evaluating the safety of a workplace, understanding industry hazards, and implementing worker protections to reduce and eliminate hazards. Track your workplace injuries and illnesses with the KellerOnline® Safety Management Tool! 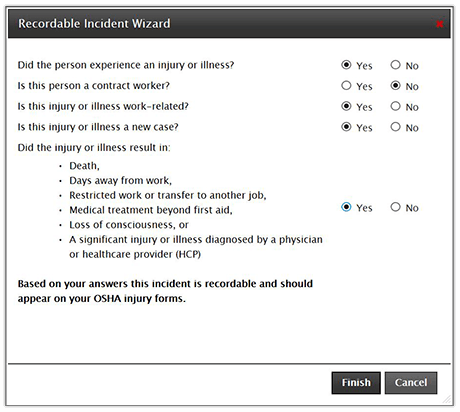 Fulfill OSHA’s Injury and Illness Recordkeeping requirements, including electronic recordkeeping, with KellerOnline’s Incidents (Form 300/301) tool. Maintain incident records for an unlimited number of recordkeeping locations and share data with other KOL members in your company for companywide reporting. "..The OSHA 300 recordkeeping system is easy and calculates everything for you - enter your specific information and location data and everything is right at your fingertips whenever you need it. Annual reports are printed easily AND on the correct state forms! Love it!" Maintain a complete electronic incident file with incident data, Form 301, corrective actions, document uploads, case notes and workers’ compensation tracking. Determine recordability with KellerOnline’s “Interactive Recordable Wizard” and track intermittent “days away” or “days on job transfer” with built-in calculators. 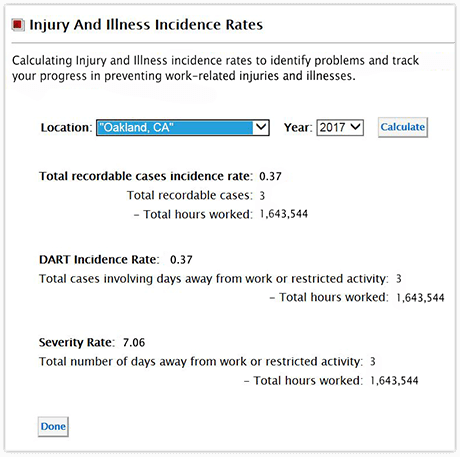 Go beyond OSHA recordkeeping requirements to track additional injury data for advanced analysis and reporting. Identify and address problem areas before they drive up costs… Or even worse, seriously injure another employee. Use the built-in functionality to calculate your Form 300A Employment Calculations and incident rates. 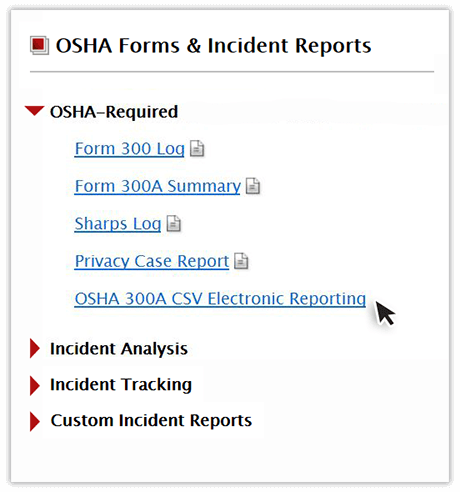 Generate your OSHA-Required Forms, and analyze your incidents by location, by job title, by work area and over time, or generate a .cvs file in the format that OSHA requires for upload to fulfill the Electronic Recordkeeping Requirements. 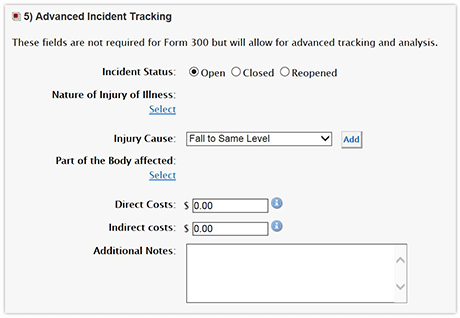 The incident tracking (form 300/301) tool will help you do more than simply comply with OSHA's injury and illness recordkeeping requirements. Register for your free trial today to start keeping track of incidents to develop a picture of the extent and severity of work related incidents.